The Jahan Cruises are equipped with first aid and key medical supplies. All senior staff members and IMO certified personnel have attended first aid courses. In the event of serious illness or accidents we are never more than 2 hours away by car or speed boat from a main hospital or 5 hours from Saigon or Phnom Penh where there are international hospitals and air evacuation facilities. We have a rescue boat that can accommodate up to 6 passengers. It is advisable to check with your doctor if you are fit for travel or require prophylactic drugs or inoculations. We apologize that we do not have facilities for disabled persons. There are no elevators or wheelchair access. If a passenger is unable to access a ship and mount stairs unaided, RV Jahan Cruise reserves the right to refuse to accept that passenger. Due to various reasons such as heat and humidity, physical activities, personal hygiene, change of food, in order to avoid stomach illness during the cruise please be cautious when buying and eating food during your land excursions, washing your hands often. Passengers must have insurance for medical expenses and repatriation; the company is not responsible for any of those liabilities. Heralded as the finest boat on the Mekong River, the Jahan provides a luxurious looking glass into the beauty of Cambodia and Vietnam. The Jahan was built in 2011 and ushered in an era of opulent cruising. 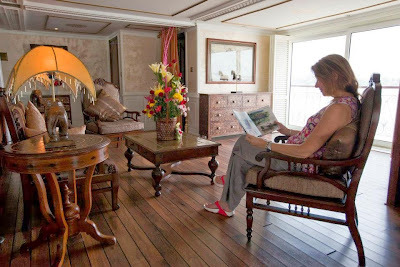 Aboard, guests are treated to grand staterooms, elegant public areas and all the five-star services of the finest hotel.